Summer Quince Forest tapestry shows the summer quince tree, inspired by the art work of Morris (1834-1896). Here we see the beautiful summer quince tree, one of the plants and trees which Morris and Co loved to portray, as inspired by his own English gardens and surrounding forests. Here we see the tree in full bloom with white blossoms, surrounded by red acanthus leaves, as well as a detailed forest background. A decorative border of green acanthus leaves completes the work. The balance of color in this work is exceptional as we see the variations of green from olives, to yellow green to emeralds, balanced with the crimsons. 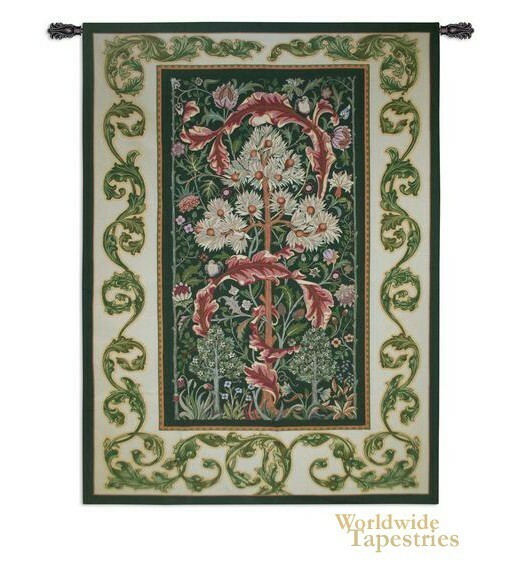 Summer Quince Forest tapestry is backed with lining and tunnel for easy hanging. Note: tapestry rod, where pictured, are not included in the price. Dimensions: W 60" x H 80"